The word Hibachi means ‘Fire Bowl’ in Japanese. Traditional Japanese Hibachi Grills consisted of a cylinder or bowl-shaped cooking unit usually made out Clay. Inside this, they’d place Charcoal, and on the top, they’d have a flat Griddle for cooking the food on. Clay is very expensive so these days manufacturers will try to recreate that old Hibachi taste by using thick Steel or Cast-Iron. This ploy allows them to sell at cheap prices although the results are hit or miss. And given that lots of Grills use thick Steel or Cast-Iron, the word Hibachi has less meaning than it used to. 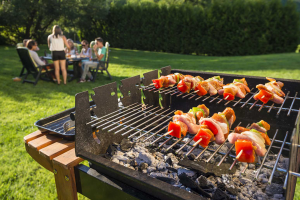 In theory, absolutely any Grill made of Steel or Cast-Iron could be labeled a Hibachi Grill. 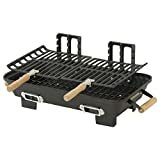 So I’m going to judge the Marsh Allen 30052 Cast Iron Hibachi 10 by 18-Inch Charcoal Grill using the following criteria. Does it have the beautiful Hibachi taste? And, if not, Does it still produce great tasting food? The design is intentionally rustic. Traditional Japanese chefs whether cooking at home or in restaurant kitchens care more about the quality of materials used than how they look. Marsh Allen has clearly lived by that mantra in the design phase of this model because what you get is essentially a box-shaped chunk of thick Cast-Iron upon which they’ve placed the Cast-Iron Grates. It’s not beautiful but it is going to be very durable. This will probably last for more than a decade given the quality of Cast-Iron used. You also get wood handles on the Grates which Marsh Allen claim don’t get hot. You can use these to place the Grates on one of three adjustable levels and it’s very easy to do. You just slot them into a groove and they’ll stay put. On top of this, you get 2 Adjustable Vents. So it’s a pretty simple Grill as traditional Japanese Grills often are. 2 Vents, adjustable Grates, Cast-Iron base. All in all a fair design and faithful to the old Fire Bowls. The 30052 Hibachi got off to a reasonable start with me. The assembly took 20 minutes which is longer than most portables take but still a pretty short time. It’s a matter of screwing in the bottom Grates and then screwing in the top ones. So no major job and one that almost anyone can do. While the Cast-Iron build will last a very long time, I can see the screws needing to be replaced after a few years so bear that in mind. You get a massive 157 Square Inch cooking surface here and for under $100 that is simply outstanding. There aren’t many Grills in this price range offering that so it’s a real plus point. I expected that for under $100 there would be some issues and the Vents are relatively useless. In short, they don’t work. There’s next to no difference in temperature or taste with the Vents open or closed. So, if you were hoping for some quality time playing with the Vents to get your food to a particular taste then you’ll be disappointed. My advice is to just forget about them and leave them closed at all times. It takes a while to warm up but once it gets hot it gets really hot. You can Grill at up to 500 degrees on this thing so if you don’t mind waiting around for about 10 minutes while it heats up, you’ll be rewarded with excellently cooked meats. The Handles are intended to be heat proof so that you can move the Grates around during the course of a cooking session. Well, they are not exactly heat proof. They do get a little hot although nothing that’ll burn you or anyone else. You should still be able to hold them whenever you need to. Some debris does stick to the Grates although this is nothing to worry about because they’re covered in Porcelain-Enamel so a light rub will get them clean. The debris and grease you need to worry about are that which drips down into the box. Some will stick and it takes a good scrub to get clean. Some will also exit the Grill through tiny gaps where the screws go in. It’s not enough to leave a pool of grease on the ground where you’re cooking, but it is something you need to know about. It’s larger and heavier than most portables. The weight is 17.6 pounds and measurements are 3.4 inches deep, 18.75 inches wide and 10.65 inches high. So it’s chunky but it had to be given the insulation needed to even attempt Hibachi Grilling. You should still be able to fit it into the car easily and it’s not that difficult to carry so mid-range score in terms of portability. In terms of taste and cook times, this isn’t really a traditional Hibachi Grill. There’s simply not enough insulation for that because you just can’t replace the kind of enclosed environment Clay provides. But food does taste outstanding and this is down to the terrific Cast-Iron Grates which are of amazing quality. And, you can use the adjustable top Grates for cooking all manner of Asian cuisine in Woks or Pan’s. Direct Grilling of Burgers and Steaks is also possible using the fixed bottom Grates. So there’s a lot of room for maneuver here despite the Vent’s not working and despite the simple design. 157 Square Inches is massive for a portable under $100 so it’ll Grill a meal for a family for four very easily. Cook times are longer than on comparable models but the quality of taste and the 500-degree heat to compensate for this. So I’d say it’s well worth the money if you want something different than what is available at this price.